Back from my travels, I wanted to get back into cooking, so I thought of this as a simple but tasty way to do that. I already had a container of pancetta, purchased from Costco a few months back, so that served as the starting point for recipe inspiration. As usual, most of the shopping was done at the neighborhood’s reliable Trader Joe’s. Before chopping all the ingredients, start boiling a pot of water to cook the pasta, which will need about 10-12 minutes to cook. After preparing all the ingredients, in a separate wok or other pan, heat up some oil over medium heat, and then add the garlic and onions, until they start to sizzle. Add the pancetta and cook until it starts to brown. Next, add the mushrooms and asparagus – and, if desired, the butter – and cook for a few more minutes. Then, add the wine, and cook for another 1 or 2 minutes, until reduced. Reduce heat to low, then add in the heavy cream. Add oregano, salt and pepper to taste, and then serve with grated or shaved Parmesan cheese. I poured the sauce onto the pasta separately, but I’ve seen some people mix the two. I’ve also seen some recipes that added some chicken broth instead of (or in addition to) the butter, but I haven’t tried that variation yet. -May 12, 2011: Other than the pancetta, oil and spices, I purchased everything from Trader Joe’s. A package of pasta (the hat-shaped orechchiette) was $0.99, a pint of heavy cream (of which I used about half) was $2.99, a package of fresh asparagus (12 ounces) was $3.49 and the package of shaved Parmesan and Romano cheese was $2.29. The leftovers should be enough for at least another three meals. 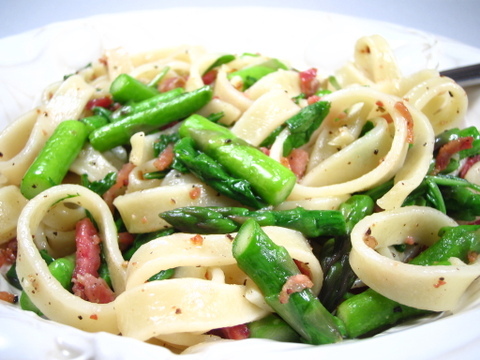 This entry was posted in Italian, Main Dish, Recipes and tagged asparagus, pancetta, pasta. Bookmark the permalink.